We have launched our stock inspiration site; a whole new way to approach looking for stock. Over the years, art buyers and clients have reached out to us in the hopes of finding unique imagery to purchase for their projects. Thanks to the branding we put into our original stock website people thought of us as a resource and we often got calls. What we realized over the years was that in order for a stock website to be successful, it had to be updated constantly. There were many times we would get requests that we fulfilled directly rather than online since the group did not have the time to keep up with the necessary updates. Add to that the fact that Andy Anderson and Ann Elliott Cutting started their own stock site and Richard Schultz, Ann Elliott Cutting and Leigh Beisch all had images with other stock houses. It became harder and harder to maintain a site with enough images to make an impact. It became apparent to us that we did not need our website to be the place where someone could see every one of the available images. We only needed to communicate that we had strong imagery for consideration so that we could get a call for a custom search. Understanding this led to the evolution of our site from a searchable site to one that offers access to the photographer’s own image collections; even if they are available for license through independent stock agencies. Since our site is not searchable by keyword and all searches are custom, we call our website a stock inspiration site. It was designed with the understanding that you want deeper access to our photographers libraries and the understanding that it is difficult to search each of their personal and stock websites independently. The purpose is to inspire clients with our images and motivate them to contact us for a customized stock photography search. 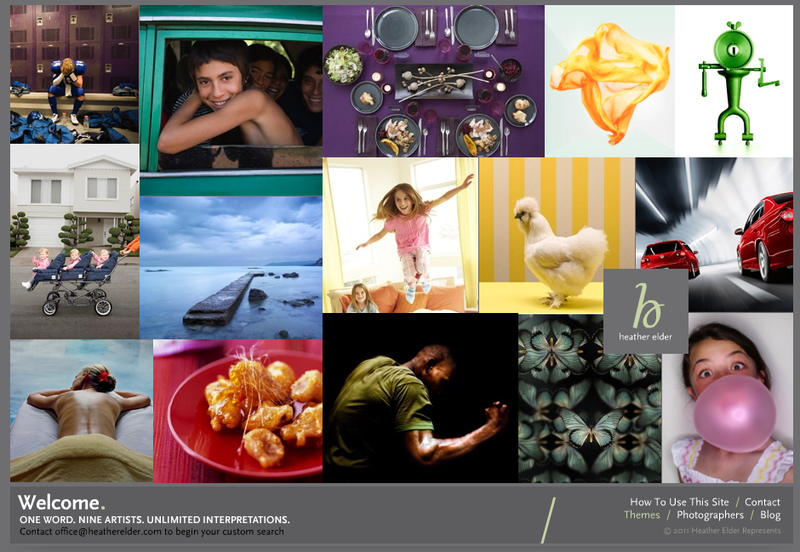 To demonstrate that we understand how clients choose imagery, each portfolio on our site illustrates a different word. For example, in the Denial portfolio, we included images that showcase each photographer’s interpretation of that word. Scrolling over the Licensing Info option, reveals the availability of the imagery, any relevant stock house notes and where to find more information. When clients have a request, it is easy for them to reach us. They are directed to click on the Contact link on the bottom of each page anywhere on the site or on the email link within the Licensing Info. We then will create a custom search by pulling from our photographer’s images available in all of their different stock libraries. Some have asked why we would want to send the sale away from us and to the independent stock houses. My response to that is simple. It is more important for us that our photographers are considered than it is for us to make the sale. The easier we can make it for our photographers to be considered, the more it will happen. For us, it is all about exposure for our photographers and how better to do that than to inspire the very people who are needing the imagery? This entry was posted in Andy Anderson, David Martinez, Hunter Freeman, Kevin Twomey, Leigh Beisch, Notes From A Rep's Journal, Richard Schultz and tagged Andy Anderson, David Martinez, Hunter Freeman, Leigh Beisch. Bookmark the permalink. Just bragging. Way to go Andy Anderson.